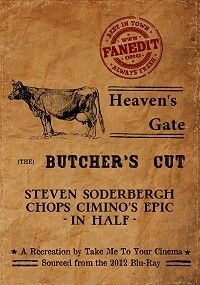 Steven Soderbergh chops Cimino's epic in half! Steven Soderbergh made a fanedit of Michael Cimino's much maligned 1980 epic 'Heaven's Gate' back in 2006 (For his own amusement). This year he decided to release it onto the internet via his blog, but the visual quality was very poor, as it was cut from the un-restored DVD (Also compressed for streaming). I really wanted to enjoy Soderbergh's dramatic slashing-in-half of this overlong but beautiful film but the poor quality stopped me. 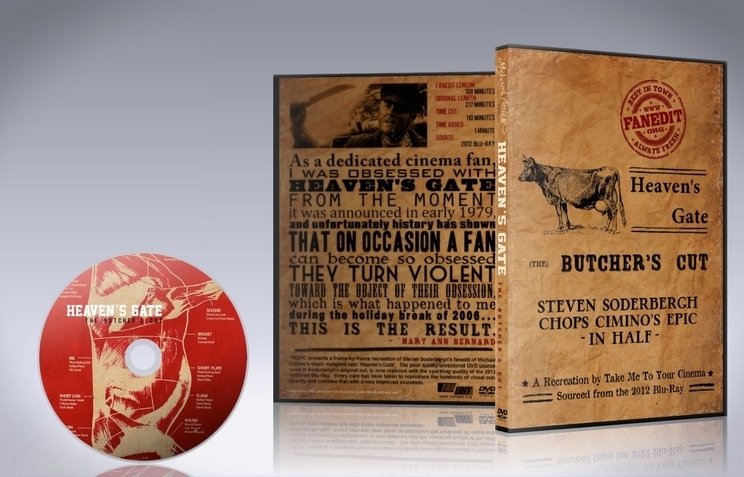 So now I've recreated 'The Butcher's Cut' frame-by-frame based on the restored 2012 'Heaven's Gate' Blu-Ray. It's Steven Soderbergh's fanedit with me just presenting it in the best possible light. 'Heaven's Gate' has many strengths, including some the most beautiful cinematography you're likely to see, a wonderfully poetic script and one of the greatest scores ever recorded. But pacing, strict editing, character motivation and narrative clarity weren't among them. I think Soderbergh has addressed many of these flaws and also reduced the inflated running time down to almost exactly a half. To match Soderbergh's visual cuts frame-by-frame using the newer 2012 HD source (Which was not available when Soderbergh made his fanedit). While every care has been taken to reproduce the 180 or so visual cuts exactly, some shots differ by a frame or two. This is due to tiny differences in the source movie from the DVD to the Blu-Ray. I have also tried to reproduce the "spirit" of Soderbergh's soundmix. However, I've made my own adjustments to the mix, to further smooth transitions and improve small areas, when I thought it necessary. Thanks to Steven Soderbergh for being brave enough to take on a fanedit of this epic-length movie. Thanks also go to those that have given me feedback in the ITW thread, including: Vultural, Aztek463, theslime, ThrowgnCpr, Brumous, hillbilly74, jswert123456, plurmonger, Ken Poirier, GregAlex, Dwight Fry, Neglify, Wraith and Gatos. Cutting Heaven's Gate down to a normal feature length must have seemed a great idea, but Heaven's Gate was never intended to be a commercial western so it ends up defying any attempts to turn it into one. This version of Heaven's Gate is easy to sit through owing to its brisk running time and the fact that most of the film's highlights remain. Unfortunately this version is missing all character development and all context leading up to the Johnson County land wars. It ends up feeling like the Classics Illustrated version of Heaven's Gate. If you aren't familiar with the long version this cut will likely be very hard to follow since there was never a strong narrative to edit a shorter version around--it feels like you are jumping into a movie already in progress, which of course you are. I would say this is worth seeing once for what was attempted with the material but there will never be a perfect or easy to digest version of Heaven's Gate and the best is still Michael Cimino's director's cut which is tedious and beautiful and occasionally exciting. This version feels like the Hollywood-butchered-my-movie cut. Still, it's a nice try.